I don't write about food… much. But I do eat, and although I am not what I would call a good cook, I do cook. I cook to live, rather than live to cook. I would have to be even more interested in food to become a good cook, but I get by. As a disclaimer, around this house we eat mostly whole grains, vegetables, and a goodly amount of beans. We don't emulate meat products, but that does not mean that I have forgotten the memory of being raised eating meat. Through the years I have tried various meat substitutes as they came along, the various tofu dogs, the not-dogs, Tofurky, and all of the other ways to extrude soy products, but they are just too terrible for words. As mentioned, around our house we don't try to make food look or taste like meat or buy foods that do. However…. and this is the exception. I happened upon the company "Field Roast" that makes vegan non-soy sausages and other products while visiting the great Oryana Food Coop in Traverse City, Michigan and was amazed. I first tried the "Italian Sausage," since I was brought up eating Italian sausage at fairs, carnivals, and sometimes at home. The product actually looked like Italian sausage, so I tried it and it tasted like it too. They have the spices down cold. 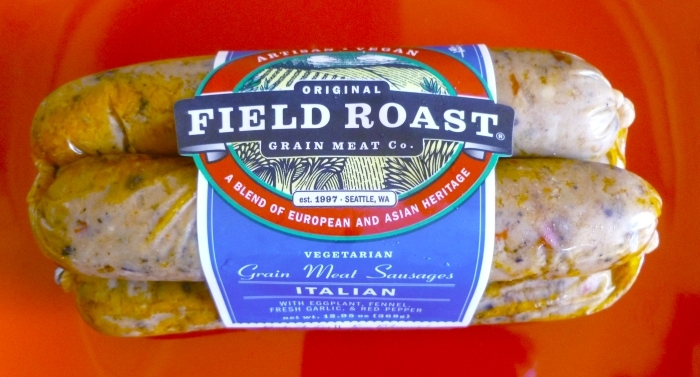 "Field Roast" is a Seattle company that makes a variety of vegan sausages, frankfurters, and the like, all made from grains and vegetables. You can find it at Whole Foods and other health-related stores. I have tried the Italian sausage, the smoked apple-sage sausage, and the frankfurthers (hotdogs), but have not tried the Mexican Chipotle sausage as I assume it is too spicy for me. They were all good, which means the spices and what-not actually tasted like real sausage. The Field Roast frankfurters actually can pass (in my book) for ballpark franks, at least close-enough for me. It has taken decades for the health-food industry to begin to make products that challenge the taste and texture of meats, but in the Field Roast products they achieve this or come very close. Caution: I don't try to make a meal of the Field Roast products À la carte. That would be pushing it. Instead I will take one of their Italian sausages, chop it up and sauté it with some brown rice and vegetables. Used that way, it is very satisfying. And I don't eat these veggie sausages all the time, but just once in a while to help dispel the nostalgia of my past habits. If you also get nostalgic, the Field Roast products are worth a try.